How to Avoid or Overcome or Quit Video Games Addiction? For entertainment, kids play video games, which used to look like a handy indoor game. Later on, the version video games changed during the time and it evolved as in the digitally impressive gadget. Not just kids, people from all ages play video games. There are PS1, PS2, PS3 and much more versions of video games available. It used to be fun playing video games, but recently it had been an addiction for those who spend all their time playing video games. Video games had been such a part of life for those people, who are so addicted to it that, they can even go out of their minds if they quit video games. Normally, people playing video games behave little crazy if they are interrupted in the middle of the game. They can even yell or fight with the other person which inversely can affect their relationship with that person. 1. The Player who plays video game gets really cranky and aggressive, they don’t stop until they clear that particular level. 2. They keep playing video games online or offline, without bothering about anyone. 3. They start abusing or yelling all the time, even at those who interrupt in the middle of the game. 4. They spend their time playing video games instead of spending it with friends or family. 5. Similarly, they spend their most of the time at home playing video games rather than outside. 6. They tend to lose control over their emotions when they are restricted to play video games. 7. They play video games more than usual hours. 8. They don’t even consider taking a day off from video games even on weekends. 9. Exhibiting nervousness while starting a new game. 10. They lose interest in communicating with human and spend more time with video games. 11. Behaving miserable when playing a video game. 12. If this kind addiction to video games is not controlled, then it will affect severely on them mentally and physically. 13. They also start forgetting daily activities such as eating, sleeping and much more. 14. Feeling of depression over losing a game. 15. They lose temper over small problems. 1. They start gaining abnormal weight. 2. As they play video games constantly, they strain their eyes or eyesight. 3. Also, they prone to experience headaches or migraines. 4. They face dehydration and internal weakness. 5. They get ill continuously, because of very bad personal hygiene. How to Quit Video Games Addiction? Video game addicted kids or adults needs to talk to their parents or friends. By this they can start sharing about their video games addiction. 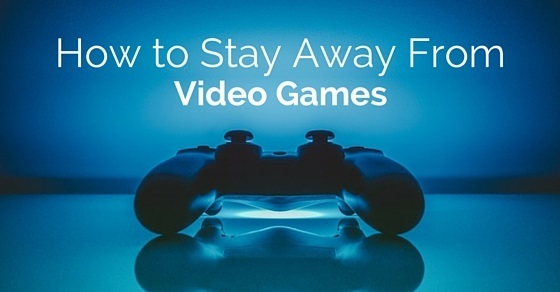 Don’t stop them, just try to shorten their playing hours so that they can control their urge of playing video games. By talking to them, his / her parents or friends will make an effort to understand them or their issues. Even if they behave little aggressive, parents or friends need to be patient with them. Sometimes parents or friends can’t control their addiction. At that time parents or friends need to take an initiative of consulting them a counselor. Counseling helps them control their aggressive nature and even helps them to quit playing games completely. Activities and sessions can help them overcome their addiction. Even counselor can talk them out of this online gaming addiction without prescribing any prescription. Sometimes a doctor/counselor prescribes some medication which will prevent them playing from time to time. Medication also can be for their illness and bad health also. It’s not necessary that the addicted patient can resist himself from playing completely. By this kind of action, addicted kids can come out of that addiction zone and even they can explore new things. They also can start seeing things in new ways. Not just outdoor games, even by playing video games with them one can help them understand the value of sharing company. By accompanying them, they will start feeling accepted and even try to change themselves. This will help him to be scheduled regarding the addiction. By alarming him/her about excess playing of the video game will create a sense of responsibility towards his/her addiction. This will slowly help him to have control over him and also let him break out of such addiction. Parents should always monitor whether he/she is following the time limit properly or not. By this, the addicted person will only understand how badly he/she is addicted to games. This will help him / her to take responsibility for his/ her overcome towards video game addiction. He / she will learn to handle aggression and anger by themselves. Shame can change people and from this, addicted person start feeling guilty about his / her addiction. When they start feeling bored or alone, they will surely start falling apart. So it’s always better to keep them busy with studies or by encouraging them to join some extracurricular activities such as singing, dancing, painting or sports and much more. These activities will occupy their time and mind which was dealt with video games before. And also let them participate them in something they love to do or play, never force them. This kind of behavior can trigger their anger and aggression very badly. Parents should make note of that, by threatening them and forcing them, you can’t stop them from playing video games. Unlike other parents, you should also be patient with them so that they surrender themselves very positively. And this can help them understand that you care about them. And also try to give them their space so that they start feeling that they shouldn’t break their parents trust over addiction. Everyone needs to know whether they are doing better and anyone appreciates their efforts they start feeling better, this helps them overcome that particular problem. Similarly, video game addicted kids or adults also could use some appreciation for their efforts and it will make them to be a better person. A single hope that they are overcoming this addiction will help them control in a better manner. There are certain ways to handle kids video game addiction, whenever he / she makes some efforts to control their urge to play. Parents should always appreciate them with little reward or loving gestures for every smallest effort. Kids responds very well to the love and affection given by their parents. Never let them stay alone at home or anywhere. Once they start feeling alone, they divert their mind towards video games which will not stop them getting more addicted. Everyone loves to be a part of a family holiday or a vacation. This will help them to divert their mind out of video games and their addiction. By spending time with the parents or grandparents all feel at home. Even by visiting their friends also helps them overcome their addiction. A little support and help can make them understand the value of loving people, not robots. Video game addicted person is not just emotionally weak, he/she can be physically weak too. So it’s the responsibility of the parents to monitor their food and water intakes and also make sure that they have their healthy food and water regularly. Nutritious food will make them fit and also makes them strong enough to win over the video game addiction. Video game addicted kids / adults try to skip their sleep usually, which will inversely affect their health and body. Parents also have to make sure that those kids get proper sleep. The human body requires minimum 6-7 hours of sleep. So parents should make note of that their kids get proper sleep to fight out their video game addiction. Addicted kids or adults tend to lose their control, even after holding their desire to play. At that point of time when nothing works, he/she should turn on the music, start listening to it. This will help them to control their anger and urge to play. Music can heal anything, any kind of an addiction can be controlled over music. Out of sight, out of mind. This will happen only if we face/see it daily, if we don’t face/see it daily then one day will forget it easily. Our room is a place where we feel relaxed and have fun, but we start feeling irresistible in our own room then there is no room for fun. To avoid such things, hide all the stuff which can remind us of video games or gaming. Feel positive about your change regarding addiction. If you start feeling confident and positive about your overcoming then rest of the process will be easy for you. Always avoid distractions and try to communicate with family and friends. Whenever you feel weak, always look for positive energy or something which help you hold your addiction. By spending more time in the gym or playground, one will completely come out of video addiction. Exercise keeps your mind and body fit, which also help in releasing stress from the body and mind. By participating in such activity, these video game addiction will be controlled without any issues or problems. Even just by walking or jogging these kind of addiction will be banished. The most important thing is to control our inner urge, which will only happen if we can get hold of ourselves. When we feel like losing control, we need to avoid thinking about those elements which gives us cravings. It’s not such a big issue, but once we start ignoring it, it will be a big issue. Make yourself strong enough to face your own fear and problems. To end this discussion, I would suggest that we never should be the slave of our own desires. As mention above, video game playing is not an addiction. But if we cross the limits of playing then it will be an addiction one day. An addiction is something called obsession. When we get obsessed with something, we lose control over it. This control over such an addiction will help us collect ourselves by learning from these problems. Therefore, an addicted person should try to follow all the above ways to quit video games addiction.